This is A Passage to India study guide. 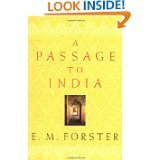 The book is a novel by E. M. Forster and is set against the backdrop of the British Raj and the Indian independence movement in the 1920s. A Passage to India is a critique of British rule of India. The British are not shown as tyrants, although they do fail to understand Indian religion and culture. They are also convinced that the British Empire is a civilizing force on the benighted "natives" of India, and they regard all Indians as their inferiors, incapable of leadership. And yet, in their own way, the English try to rule in a just way. Ronny, for example, the City Magistrate, is completely sincere when he says that the British "are out here to do justice and keep the peace" (chapter 5). And there is no trace of satire in the passage that shortly follows this, which describes Ronny's daily routine: "Every day he worked hard in the court trying to decide which of two untrue account was the less untrue, trying to dispense justice fearlessly, to protect the weak against the less weak, the incoherent against the plausible, surrounded by lies and flattery." Ronny is also aware of the hostility between Hindus and Moslems, and believes that a British presence is necessary to prevent bloodshed. Even Fielding, the most sympathetic of the English characters, does not argue that the British should leave India. However, the British lack any ability to question their own basic assumptions about race and Empire, and as such they become the objects of Forster's biting satire. Please click on the study guide category you wish to be displayed. Links on each page can guide you through all the sections you need to study.